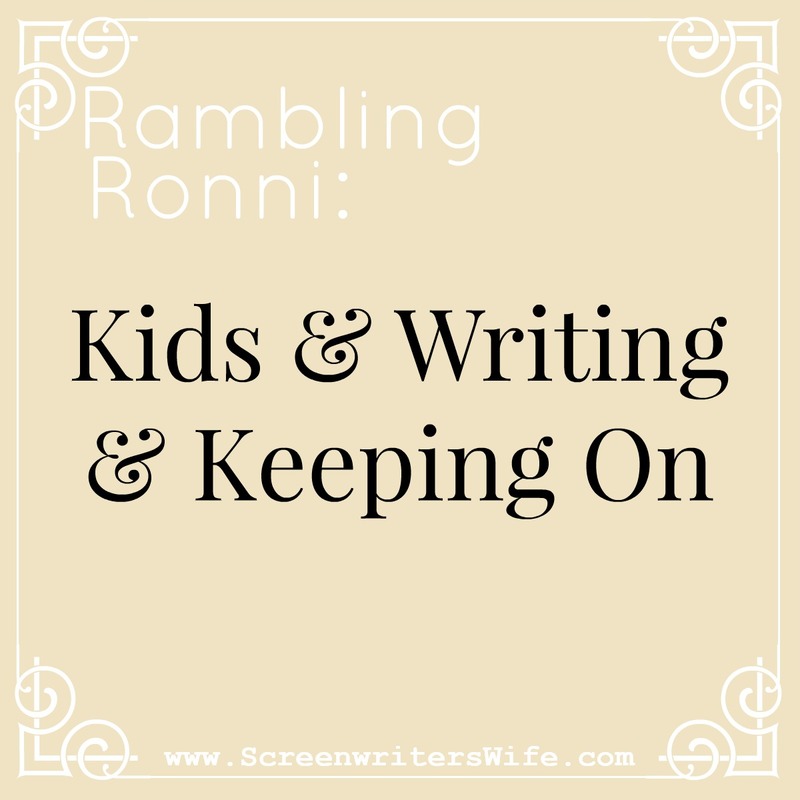 Rambling Ronni: Kids & writing & keeping on. 3 kids. Geez. I love ’em. But as I’m a person who typically wants to think way too deeply into everything, it’s downright HARD to give each child a plethora of thoughts into each of their individual personalities and what makes them each tick and then research and analyze the best method for teaching that exact method in which they comprehend and react best. My daughter has very strong emotional reactions to things that are hard to calm her down from in that moment, my older son is just spacey all the time and I can never tell if anything I say to him is sticking in his head, and my baby…well, my baby is awesome. He’s just sweet and I get to hold him and cuddle him and he doesn’t tell me ‘no’ and I don’t have to put him in time out or figure out how to teach him to pick up his toys when he’s so spastic and doesn’t pay attention to anything. Lol. Really though. I love my kids. Babies are the best. I didn’t get to realize this as fully with my older two. But sure, you have to be attached to them a lot (Freddie comes everywhere with me! He’s here in the stroller right now at a coffee shop writing), especially if you’re breastfeeding and don’t want to pump. Because let’s face it, pumping takes up too much time and you feel like a cow and if you don’t have to do it, why do it? AmIright? But really. Babies are the best. I never thought I’d be a baby person, especially during the “blob” phase. But I’ve decided that I kind of am a baby person…right up until they begin to crawl and stick everything in their mouths and you have to be hyper-vigilant all the time to keep them for choking or poisoning themselves. If we could just skip from there, around 7-8 months or so, to oh, maybe 5 yrs old. 5 is a good age. Independent, can talk about their thoughts (with help/prompting), can learn, can be held to some sort of expectations, you can take them places, they are FULLY potty trained and can get dressed and put on their own shoes. 5 is great. I don’t think my personality is the best fit for the toddler/preschool age. Some moms seem to cut out for the little kid stage and all the cute games and activities that come with it. I don’t think that’s me. But that’s ok. I love my kids still. My daughter is becoming this cool little person (even though she has a short temper) and I’m having fun with her. And I got this sweet baby who isn’t too old yet to give me panic attacks and force me to section off parts of my house that I’ve actually picked up and vacuumed enough to feel he’s safe in. KP and I are writing again. We pulled out our script from last year, and are sprucing up a scene or two to make it sparkle more. That’s actually what I’m supposed to be working on at this coffee shop right now. Man, writing with a spouse is hard. Writing with 3 young kids is hard too. Having the stamina to keep going when it feels like all you ever do is revise and rewrite and hope that someone likes what you wrote is hard too. To throw so much passion into lines only to have to cut them and start over. Over and over again. So much passion and thought and emotion and energy goes into every little detail…that no one will ever know about….that may never get made. It’s hard to continually wonder if you’re just wasting time. Hope is hard. But as been the whole theme of this blog – we’re still keepin on keepin on. And I need to get back to this script now. « Rambling Ronni: Living, dying, spacetime.